Taste of the Week. Eight Degrees Blowhard Imperial Stout. Long yarn on the label, rare deep-diving whales who go down to the darkest black and blow hard on their return. 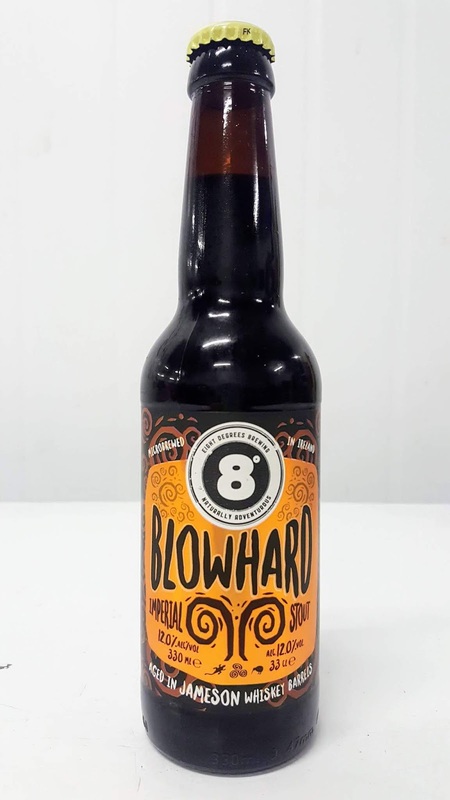 The Eight Degree brewers trawled to the furthest limits here and, barely decompressed, came to tell their daring Christmas tale and they called this deep-dark and delicious creation Blowhard. The smooth and flavour-packed beer, from regions hitherto unexplored, was quarantined for 30 days in Jameson barrels. Don’t worry, it is now safe in this Christmas season to open the little bottle but do pour slowly, sip slowly too. No point in going overboard when the hard work of the voyage is done. Enjoy the amazing flavours and do watch out for a nice hint of uisce beatha in the long aftertaste! This is a classic Imperial Stout, with knobs on. They stuffed the mash tun to the gills, double mashed for extra flavour, used premium Irish malt, went overboard with toasted dark malts and extra roasted barley – all before committing the beer to a month long sentence in Jameson whiskey barrels, courtesy of their friends in Irish Distillers. It is a spectacular seasonal special. Try it, they recommend, with steaks and cheese. Or at the end of the meal, pair with a dark and rich Christmas pudding or a decadent Belgian chocolate mousse. Didn’t have either in the house last Saturday night but did have some Mince Pies (made by Foods of Athenry). Got lucky with that pairing as it worked a treat. Pudding is next! Availability: Very limited draught. 330ml bottles (RRP €4.20). Dreaming of a Wild Christmas with Brett, Black and Brut. 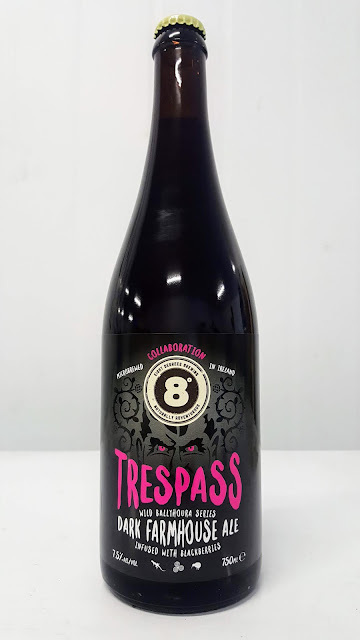 Eight Degrees Trespass Dark Farmhouse Ale with Blackberries 7.5% ABV 75cl bottle. Raised with Brett and infused with Blackberry, I was thinking funky and farmyard as I pondered this Christmas special from Mitchelstown. And then when the person alongside, who had started ahead of me, said it smelt like cider I was thinking of some early natural wines that had ill-advisedly been put on the market, quite possibly putting some people off natural for a long time. A friend of mine who had then recently opened a market stall, always maintained you just had to get a drop or a morsel into the potential customer’s mouth to make the sale. So I remembered him as I raised the glass and soon the preconceptions vanished like the courage of a Ballyhoura poacher disturbed in the act. This dark farmhouse ale is not a rough and ready country bumpkin (by the way, what do you call a city bumpkin?) at all. Au contraire, Rodney. 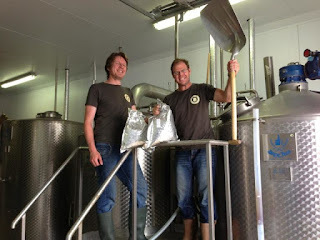 And its natural sophistication is not overly surprising when you consider the distinguished “assistant” the Eight Degrees brewers had. None other than Jamil Zainasheff, owner of California’s Heretic Brewing and author of Yeast and Brewing Classic Styles. 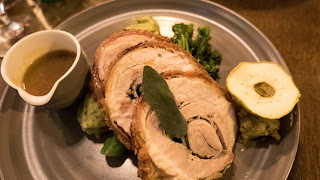 I enjoyed my first glass with a slow-cooked dinner of Woodside Farm Pork (shoulder) and a bunch of winter root vegetables. The experience was excellent. But how would my Trespass drink on its own? Excellent is the answer, again. 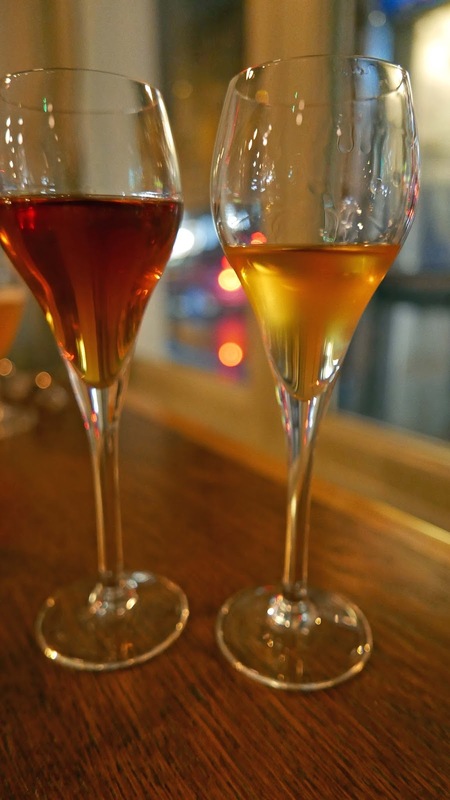 The adventurous “melange” is more about the Brett than the hops. 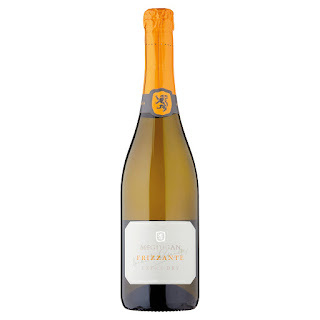 Not a bubble in sight in the dark brown liquid but a refreshing tang and a cutting acidity, the kind you’d come across in a good Brut champagne. A classy drink which, by the way, has spent no less than 15 months in Burgundy (Pinot Noir and Chardonnay) barrels. And, after finishing school, Eight Degrees added even more of those Ballyhoura blackberries. Perhaps not my favourite aromas but now this rich and dark saison-like beer with its lip-smacking finish is a firm favourite. Brett, Black and Brut is the new order! Now, I’d better order that goose for Christmas, as that’s the recommended match from Eight Degrees. 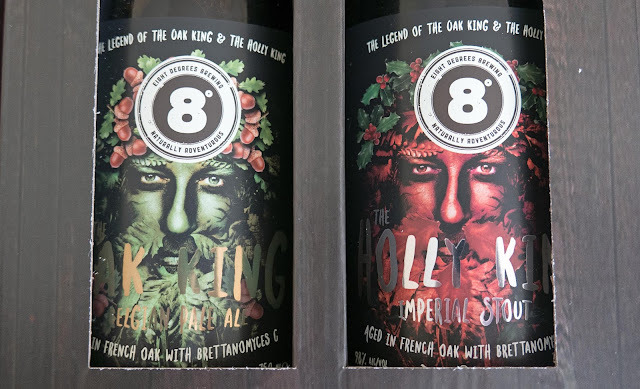 Trespass is the latest in their Ballyhoura Wild Series which already includes Hopsfume 100% Brett IPA, The Oak King Belgian Pale Ale, and the Holly King Imperial Stout. Two Hundred Year Old Pub Gets New Lease of Life Thanks to Máire and Victor. 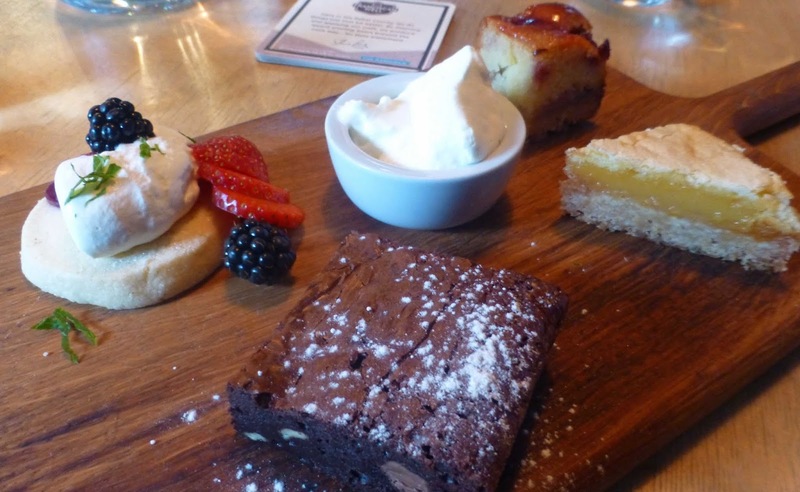 Emphasis very much on Local Food and Drink at O’Mahony’s Watergrasshill. Two Hundred Year Old Pub Gets New Lease of Life Thanks to Máire and Victor. 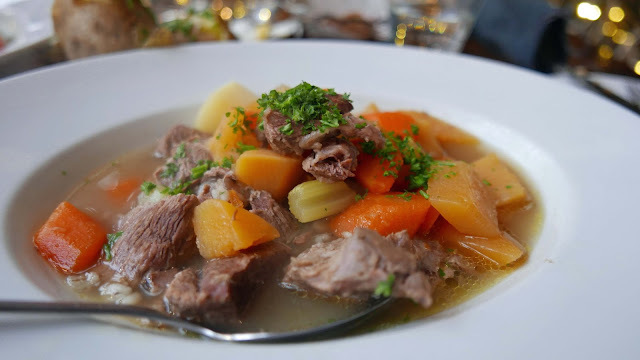 Emphasis very much on Local Food and Drink at O’Mahony’s Watergrasshill. O’Mahony’s Pub in Watergrasshill packs a lot into its weekend life. Start with the food: delicious sharing boards and small plates are based on the best of local and seasonal produce and don't cost the earth. While you will get your mainstream pints, you may also enjoy a good craft beer or two and their current House Drink is Bertha’s Revenge Gin made by their neighbours over in Castlelyons. And that’s only the start of it. Take a look outside and you’ll see an area “as big as a field”. More like a big garden, with a stage platform and there’s lots of cover here making it an ideal spot for a celebration of any kind (they’ve already had a wedding here) and great too for BBQ with its own bar. And it’s also here that you’ll find the Long Room, the music venue. And if you feel like dancing, go right ahead. Take the floor, a real dance-floor, maybe a chunk of a ballroom of romance recycled. 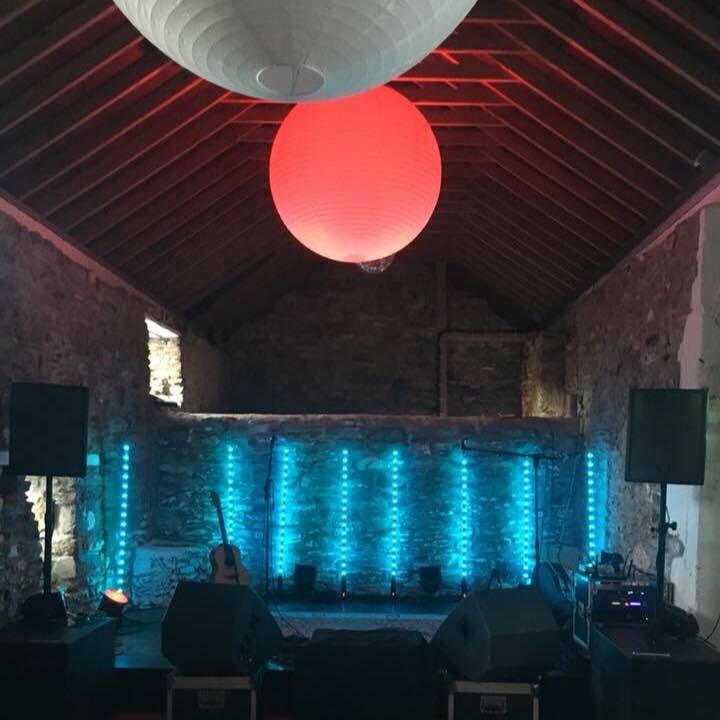 And all that music and dancing takes place in a recycled cow shed. The village used to be a staging post for cattle on their way to the city and indeed, there was a slaughter house at the back (a glasshouse will be going up there soon). The meat hooks hanging in the bar will remind you of those times. And that’s not all you’ll see hanging here. Máire is an artist and her works are proudly on display. And that leads me to the kids. Yours are more than welcome. Their own menu is up on the big blackboard. 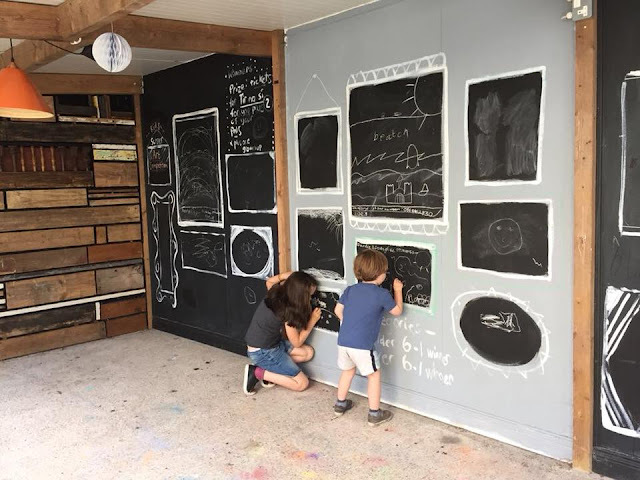 And there’s another blackboard, a whole wall of them, outside in a smaller sheltered area. Here the children can draw to their heart's content and every now and then there is a competition. Just so much going on here. The Bushby strawberries, those beautiful fruits from West Cork had run out, just a few left. No problem. Blackberries are growing well “out the back” - lots of herbs there too and there will be more. So those blackberries are on the menu in an instant! Beat that for fresh and local. So what did we have al fresco on a sunny Friday evening? Started with Antipasto (10.50), one of three sharing boards. 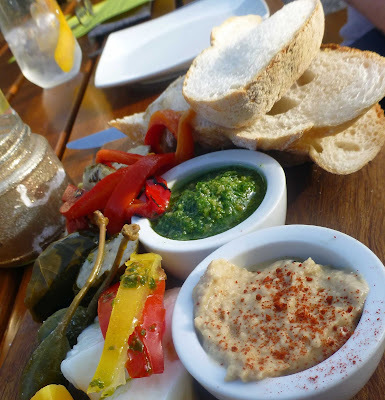 It consisted of Pana Sourdough, Mozzarella from Macroom, artichoke hearts and more, with little bowls of hummus and pesto. 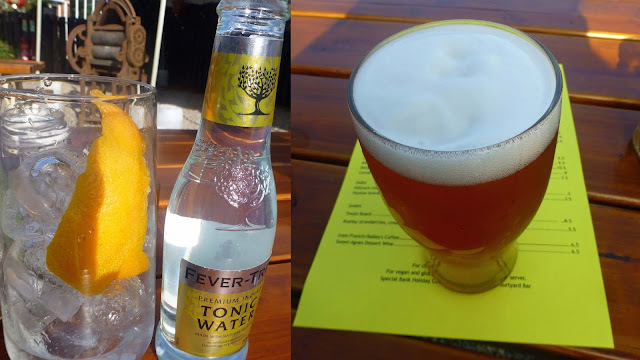 Enjoyed that, me sipping from a cooling flavourful pint of Eight Degrees Howling Gale Ale (5.00) while CL was enjoying some of Bertha’s Revenge Gin with Fever-tree Tonic (9.50). Victor is well known for his part in the House Cafe in the Opera House and there are similarities with the food in that successful venture. For instance, suppliers such as Ballyhoura and Kilbrack Farm also feature in Watergrasshill. As does butcher Eoin O’Mahony (no relation). 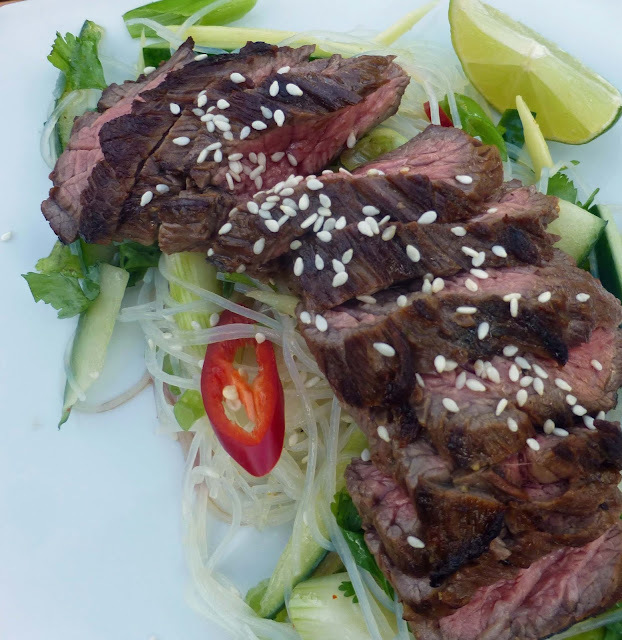 The O’Mahony’s Bavette steak salad, a beautiful Asian marinade worked a treat on the meat which is scattered with sesame seeds and served with vermicelli noodles (9.50), is a beauty. 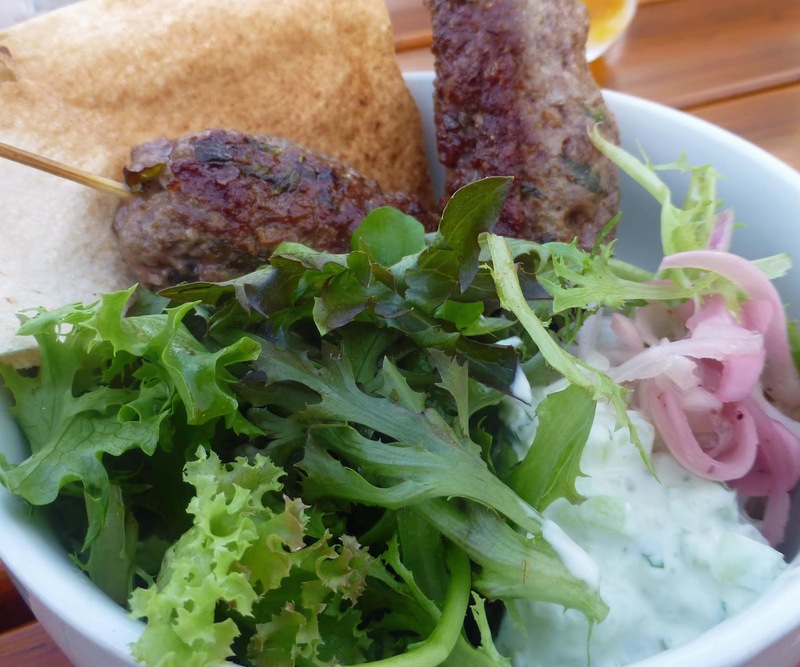 The Lamb Kofta is another highlight, also €9.50. This comes with Cork made Syrian flatbread, hummus, tzatziki, sumac pickled onions and leaves. Dessert, with ultra local blackberries! The timber serving boards are made in nearby Carrignavar. 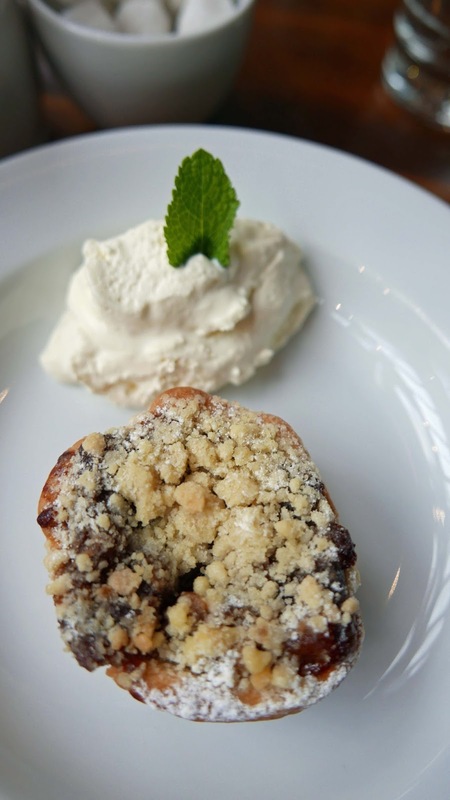 Time now for dessert. With the strawberries running out, Victor suggested the Treats Board (8.50). And we shared the delights of the mix of a Shortbread treat with fruit (those blackberries from Watergrasshill, not Guatemala), a chocolate brownie, a lemon curd slice, and more. Too full to dance after that! Only joking. 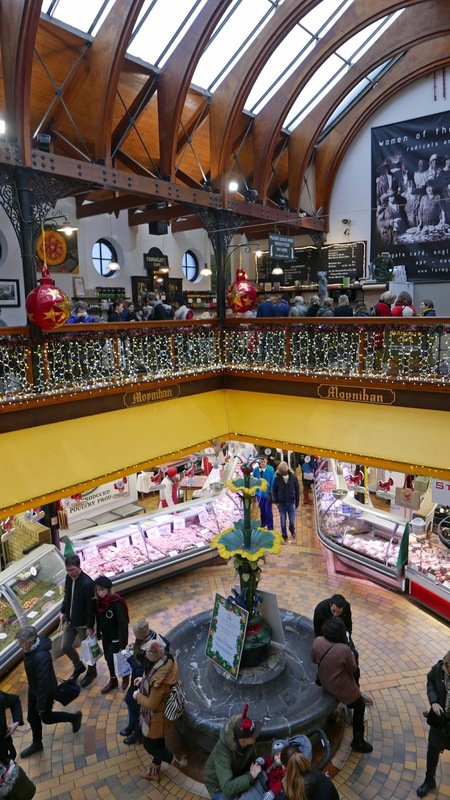 The food here is excellent, well sourced and you won’t be stuffed with chips, mash, baked potatoes and so on. But do watch out for their side of Patatas Bravas, just one of many good things in this warm welcoming venue. Try it out soon, just ten minutes from the tunnel! 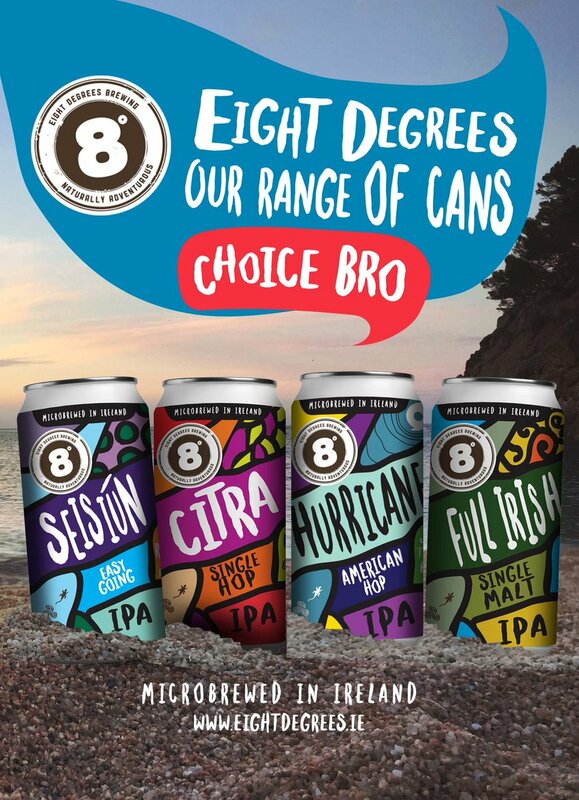 Eight Degrees are the latest brewery to can their beers. The Mitchelstown based firm launched three cans this March, two with established favourites and one with a newcomer. Very colourful cans they are too, joining a myriad of other colourful cans on the shelves. 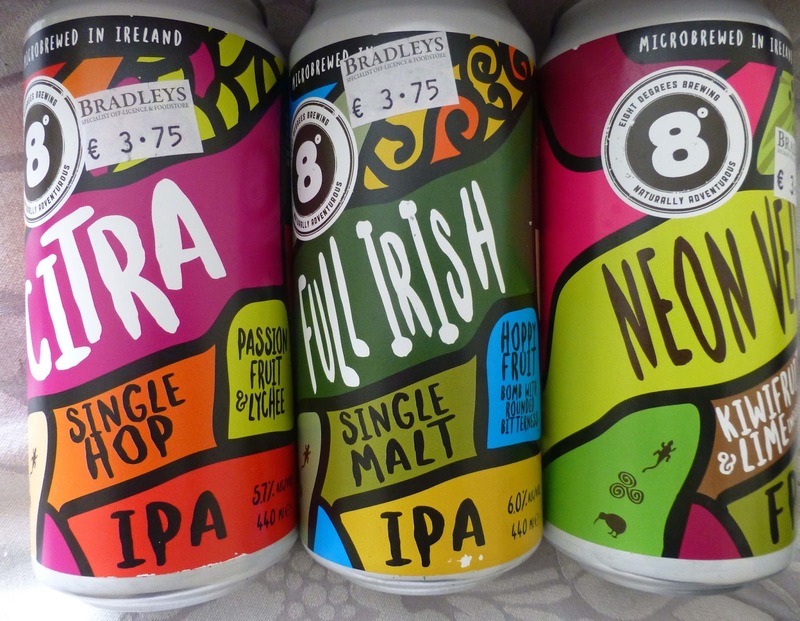 Canfusion for me but luckily Michael Creedon in Bradley’s always knows where the one you want is situated. This is the newcomer, a limited edition beer, and only available in cans or on draught. This cloudy beer is a golden colour. Aromas are bright hoppy. Very pleasant smooth intro. Infused with kiwi and lime and more flavour from the Citrus and Amarillo hops, all before a dry hopping with New Zealand hops Pacific Jade and Motueka. A lovely fruity ale, “hazy, silky and fruity” as they say themselves and with a dry finish. 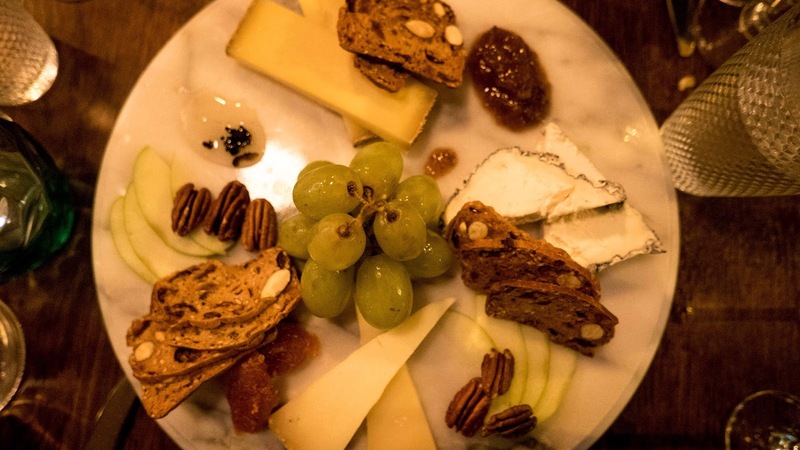 Lots of food pairing suggestions on the Eight Degrees site but the one I fancy is: “a chunk of good Irish farmhouse cheddar will play off the fruit flavours in both elements of the pairing”. Tropical fruit aromas and flavours on display from the get-go here with this pale orange coloured beer. Hoppy notes too in the aromas. The Citra hop holds up well on this solo run, its tropical flavours scoring all the way through, the malt also playing its part in quite a flavoursome drop indeed, fruity and juicy and a good finish as well. Think I'd like to try that with the suggested “grilled spicy fresh Gubbeen chorizo sausages”. This excellent beer is well known at this stage, having gathered award after award following its 2014 launch. They describe this as “a hop bomb” and so it is but the bitterness in this pale gold drink is rounded. No shortage of hops in the aromas with citrus and floral notes in there too. Local barley is the malt hero here but the hops (Ahtanum, Centennial, Citra, Amarillo) share the limelight as this clean tasting well-balanced IPA makes its journey across the palate before you enjoy that rounded bitterness at the finalé. 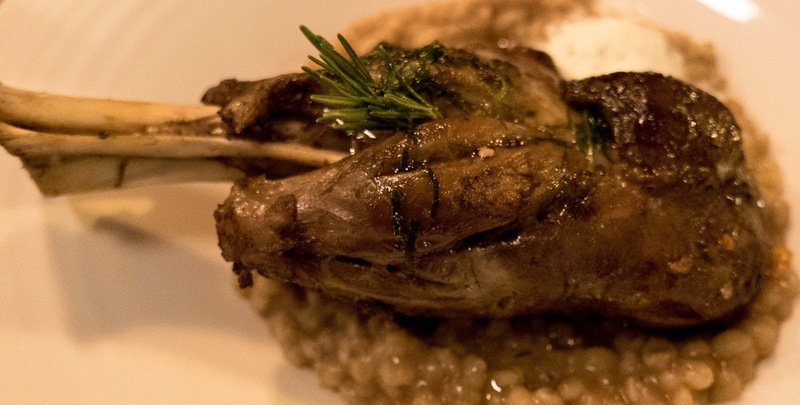 Quite a few food suggestions again; I’m inclined to go for the smoked duck, especially if it's Ummera. So there you go. An excellent way to pass an evening watching Champions League on the telly. Just as well, Barca stopped at three against Chelsea! 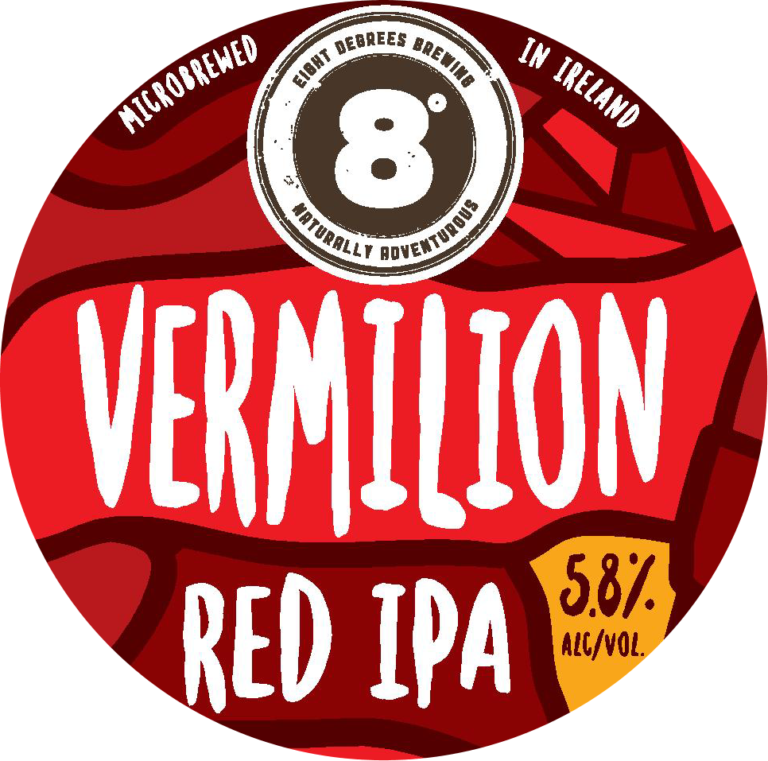 Stockists: Eight Degrees beers are widely available in Ireland. Also in Italy, France and the Benelux countries. See stockists here. I got my three (for a tenner) at Bradley's Cork. Winter Kings by Eight Degrees. Royal Clash of the Oak. And the Holly. Winter Kings by Eight Degrees. Royal Clash of the Oak. And the Holly. Ale (left) and stout, peaceful in the pack. 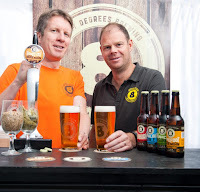 Quite a lot of talk about Brett C when Eight Degrees recently launched their pair of winter seasonals, a Belgian Pale Ale and an Imperial Stout, both part of the Ballyhoura Series. Who the hell is Brett C? I googled it and found that he is a Melbourne, Australia based photographer who specialises in sport, fashion, event and people photography. We all know Eight Degrees have antipodean connections but this is the wrong answer. 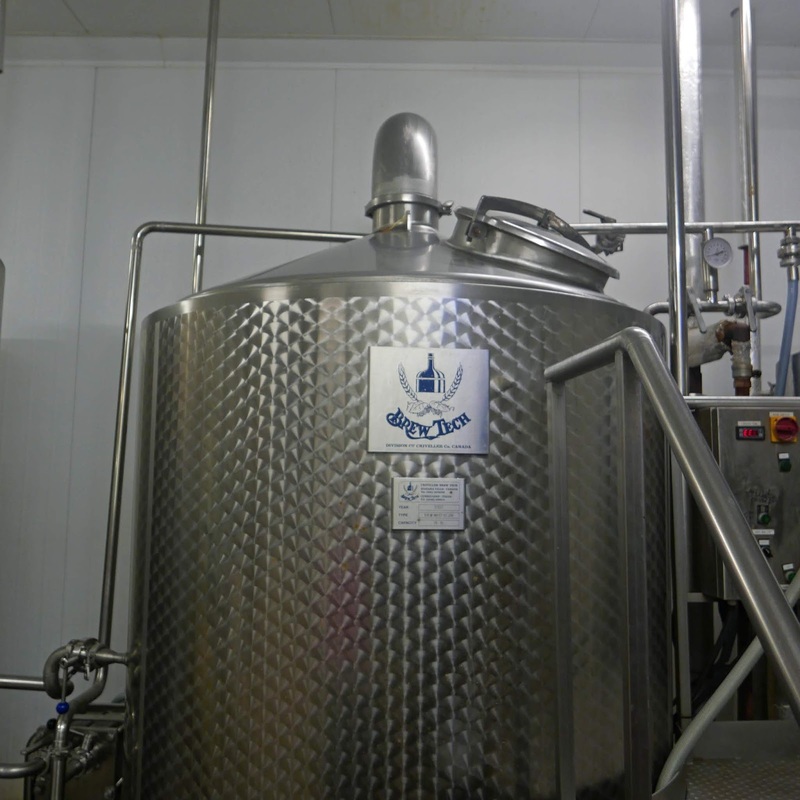 Brettanomyces is its proper name and it is a yeast that the brewery has used in each of these beers. 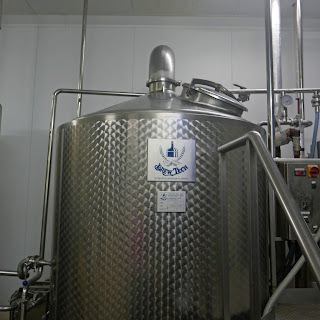 Brett C, the yeast that is, is more likely to be noticed in the aromas than in the flavours and funky is the term regularly associated with it. Mid-winter is a source of many legends and myths and the battle between the oak king and the holly king is the one you’ll see on the bottle labels. 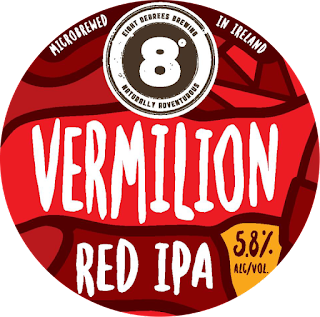 Various versions abound and here are two links you might explore when sipping these Mitchelstown gems. This Belgian style pale ale has an amber robe. There’s an almost cider-y intro to the palate, gradually getting more complex before a tart finish. Sour maybe but not crab apple sour, perhaps the oak has rounded off any extremes. Austere is probably the single best word to describe this sophisticated offering. Don't let the “austere” put you off though. This is one of the most interesting seasonal beers this Christmas and I may well be serving it as an aperitif in champagne flutes as suggested by the brewery. Brewery tips: Serve well chilled in champagne flutes as an aperitif on Christmas morning, with a half-dozen oysters or some smoked salmon, or take it to the dinner table to pair perfectly with your turkey. As black as a mid-winter’s night in a Ballyhoura boreen, though it starts with a tanned head that, like many a tan from a bottle, doesn't last too long. The intro to the palate is intense, treacle like in flavour or maybe it’s funk, but soon more traditional flavours, including coffee, take over. Some vanilla there too, all brought together, along with Brett C of course, during the sojourn in the oak casks (previously used for Pinot Noir). Strong start, strong finish, quite a player for the Christmas team. 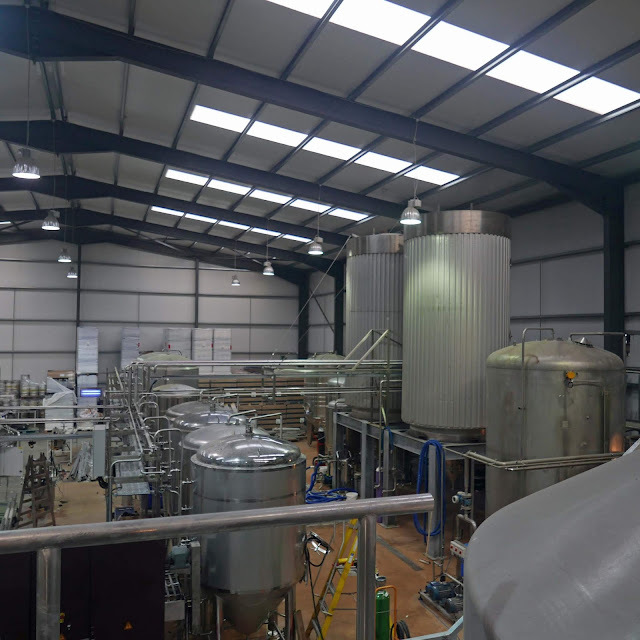 Brewery tips: It's a hugely complex beer, so pour it into snifters and sip it slowly to end a meal with a slice of spicy Christmas Cake, studded with nuts and dried fruit, classic Black Forrest Gateau or a box of cocoa-dusted dark chocolate truffles. 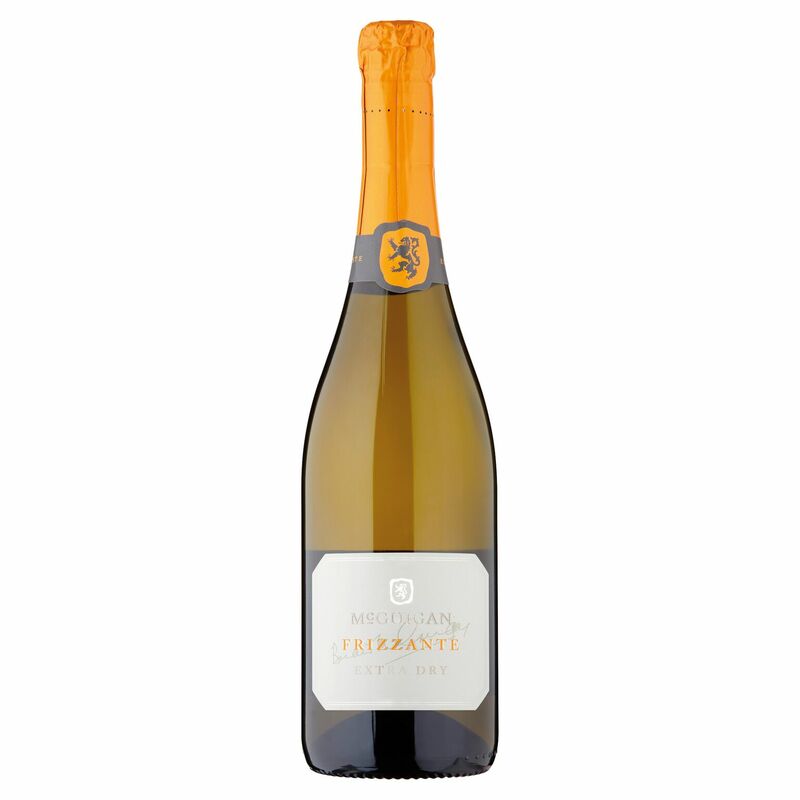 * Both are packaged in 750ml amber champagne-style bottles and are available individually or as 2 x 750ml bottle gift packs (RRP €19.95). 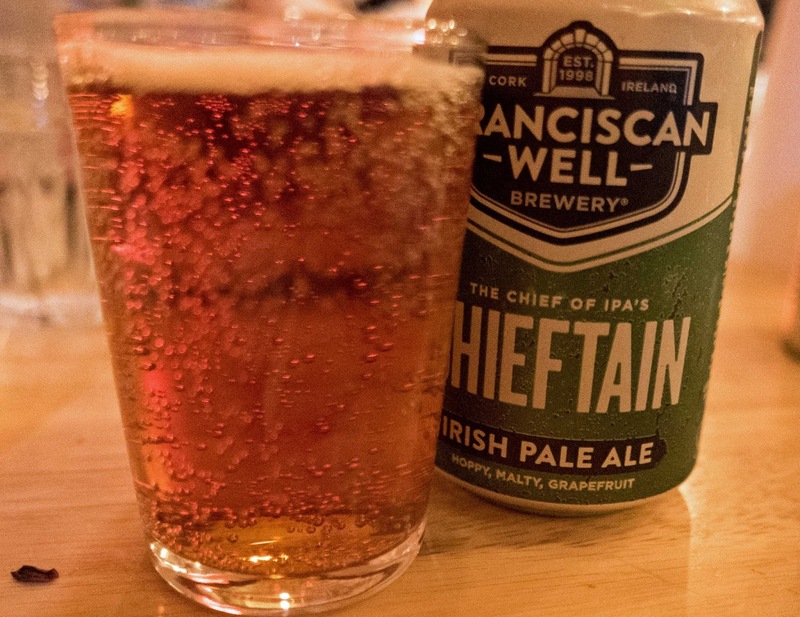 They are widely available, including at Bradley’s Cork; for more stockists and more info, click here: BeoirFinder App now available for Android and iOS . If you visit Holy Smoke, and you should, you’ll be visiting a kingdom of fire and smoke. And your royal guides will be John Relihan and Deccie Walsh. John welcomed us to their tasty palace on the Mardyke last Tuesday night for a rather special evening: six courses of pit smoked BBQ paired with either Irish Craft Beer or Irish Whiskey. 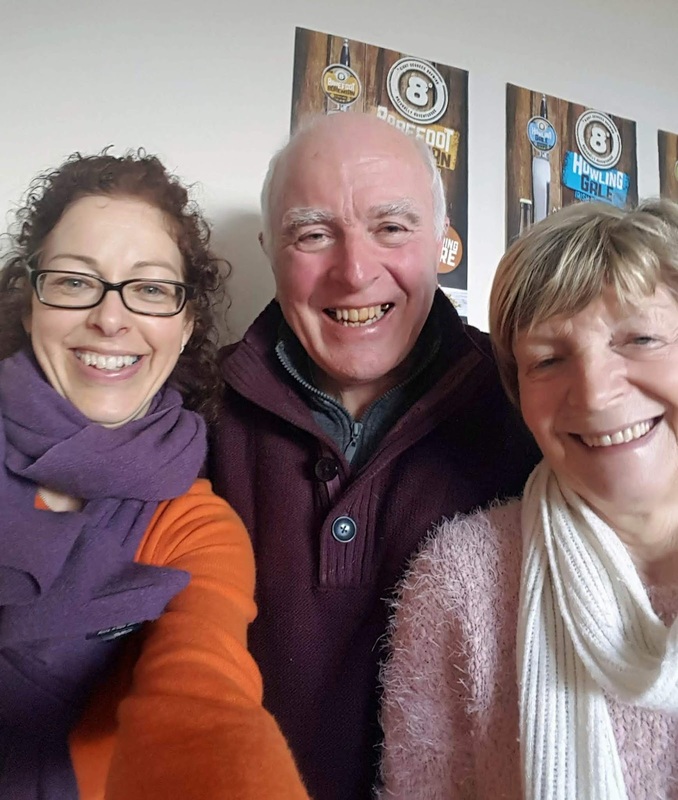 Caroline Hennessy, of Eight Degrees and author of Slainte, introduced the beers while Killian O’Mahony, a recently qualified cooper at Midleton Distillery, told us about the whiskey. Did you know that Holy Smoke is housed in the original Woodford Bourne cellars (1875), that stored at one time over 50,000 gallons of choice whiskies, Cognac, rum and casks of wine, sherries and ports? John told us they cook here “with fire”, using a Japanese Robata grill and a large smoker. 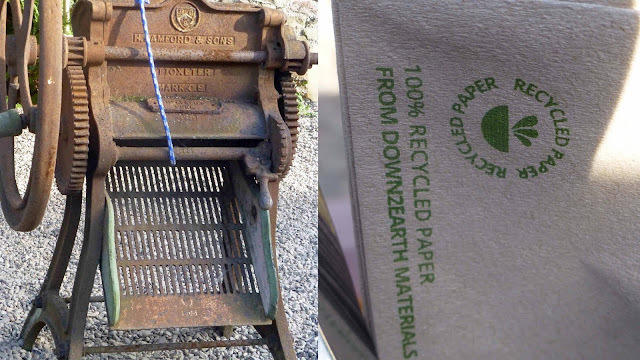 They use sustainable charcoal (supplied by an Oxford firm). 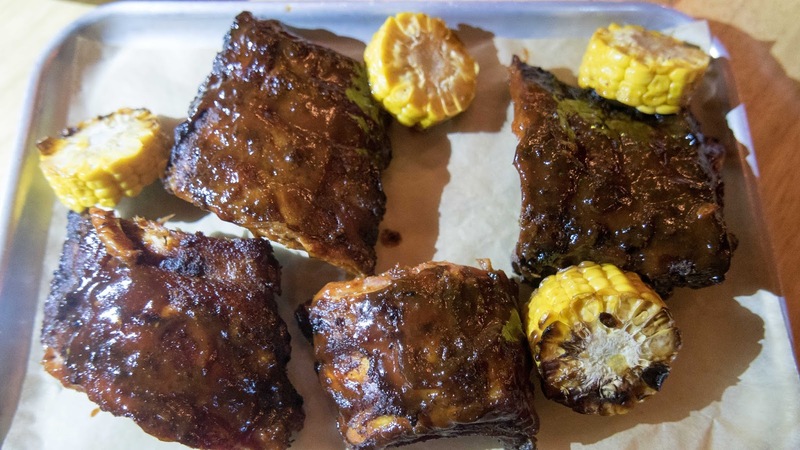 Ribs take four hours while brisket and pork can take 14 to 16 hours. He stressed the importance of using the right charcoal and the right wood. 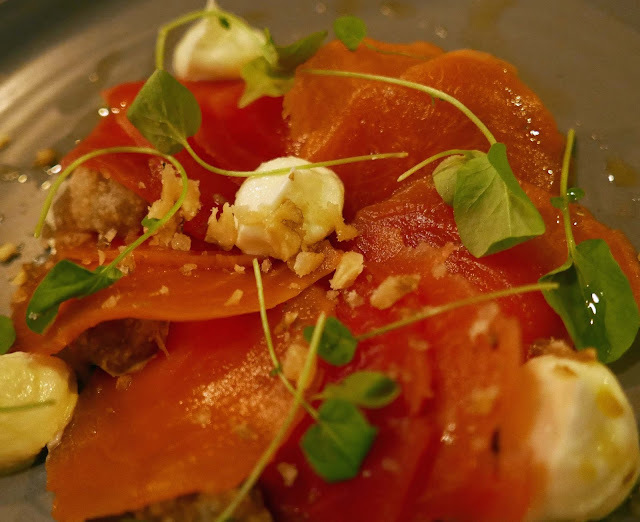 He has trained with some of the best, including Jamie Oliver, and in many cuisines including BBQ, Italian, Spanish, Japanese. “It’s been quite a journey,” said the man from Duagh in Co, Kerry. They have just introduced steak to the menu - “you can expect lots of different cuts and do check out our Jazz event on October 25th.” Link is here. Six courses seems like a lot. But the Holy Smoke team judged this to perfection. It was quality all the way but the quantity was spot-on too, not too much and certainly not too little. After a welcome drink of Prosecco and a bowl of pickles and pork scratchings, Caroline introduced the first of the beers. “The Franciscan Well were among the first of our craft brewers and their traditional red ale, the Rebel Red, is great with pork.” And our first dish was Gubbeen Hot Links Sausages. 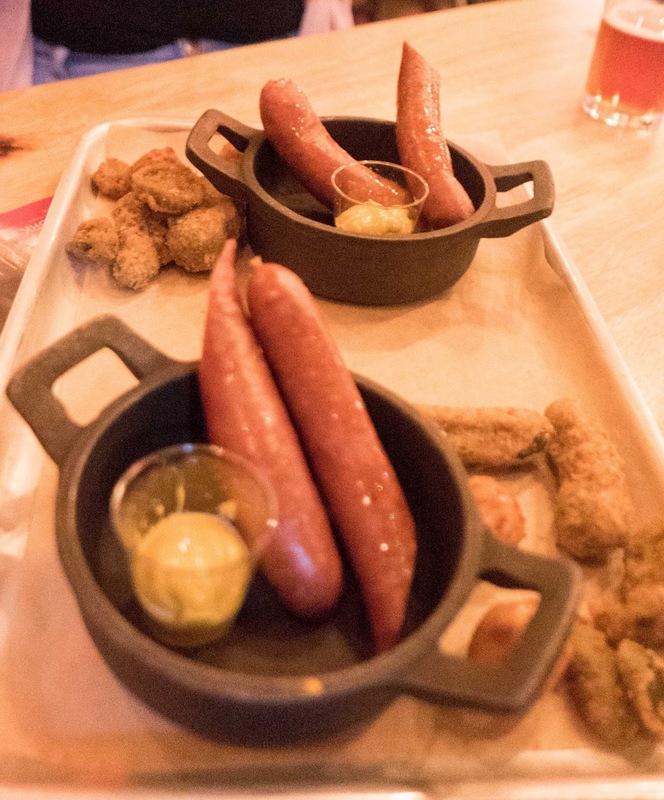 These spicy sausages, commonly used in southern US barbecues, got the taste buds up and running. More pork now but of a very different kind: Wet Rubbed Baby Back Ribs (marinaded overnight and smoked for four hours over oak). 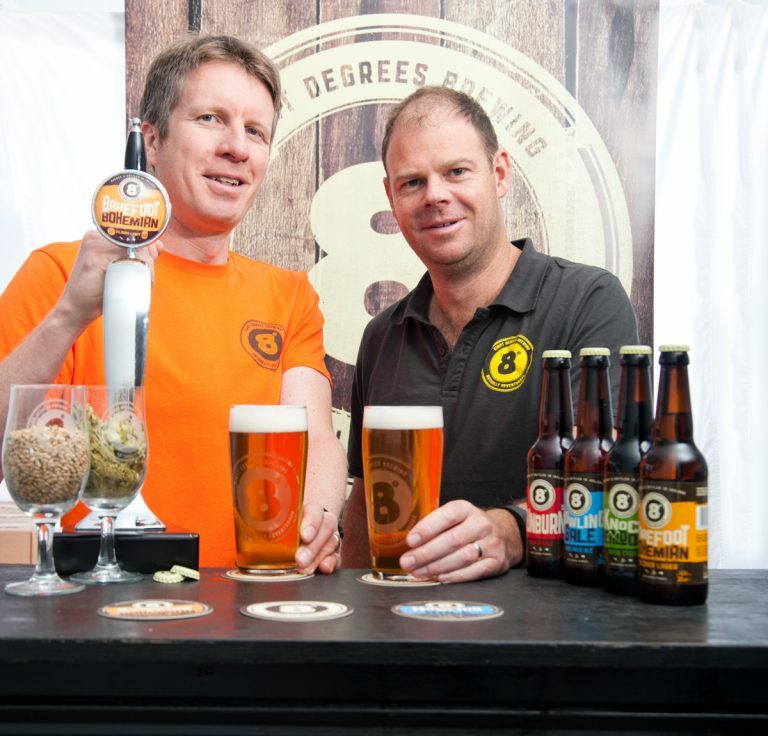 Caroline praised the quality of Irish Malt and said Eight Degrees were proud to use it. And certainly the Howling Gale Pale Ale had a good solid base of malt, a lovely aroma and not too hoppy and proved a good match for the ribs and the cornbread. 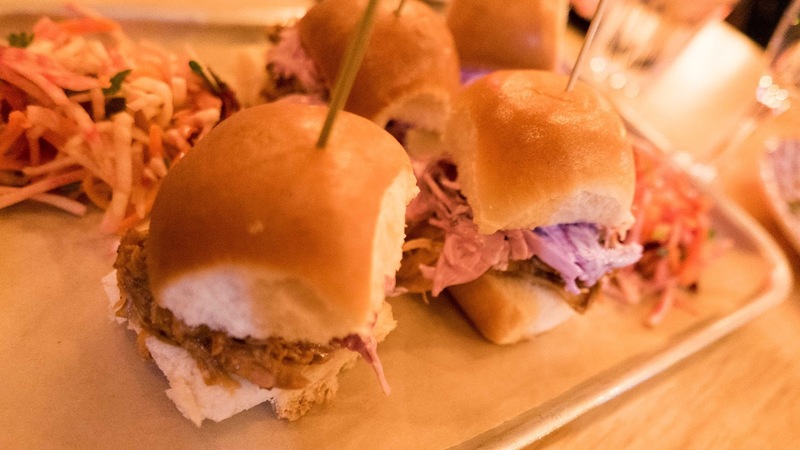 And next came one of the highlights of the night: Pulled Pork Slider (shoulder smoked low and slow for 14 hours). Amazingly succulent and delicious and the Stonewell cider, that Caroline had been keeping in reserve, proved an ideal match. Head Chef Deccie Walsh managed to take a few minutes away from the kitchen and told us of his love for slow cooking and nose to tail cooking. He really enjoys this type of event. After last night, we all do! 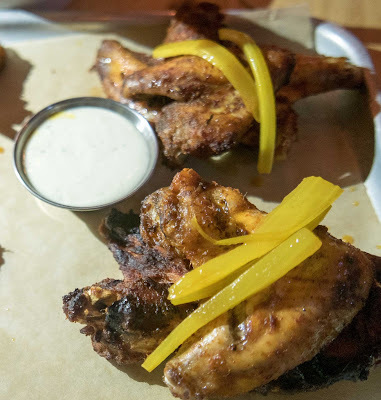 Another highlight next: Pit Smoked BBQ Chicken Wings (marinaded, smoked for 4 hours and char-grilled). Accompanied by pickled celery and a blue cheese dip, this was a superb mid-menu course, fingers in action again. And the beer? Another from Eight Degrees: the Barefoot Bohemian Pilsner, a nice light beer in the traditional Czech style and excellent with the wings. 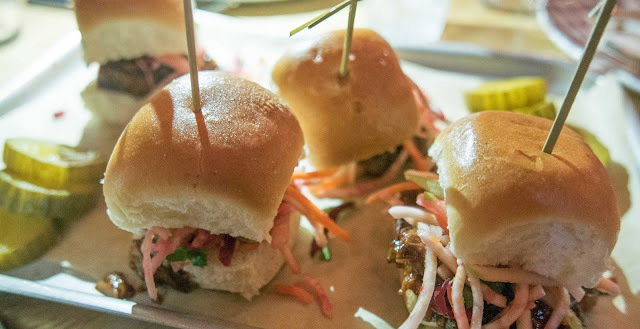 Brisket Burnt End Sliders were now arriving on the table, another highlight for me, all the more appreciated when we heard that their journey to our plates had started during the storm of the day before. Killian told us about the importance of the casks as he introduced the Green Spot whiskey made at Midleton from pot still whiskey aged between seven and nine years, with 25% coming from sherry casks. 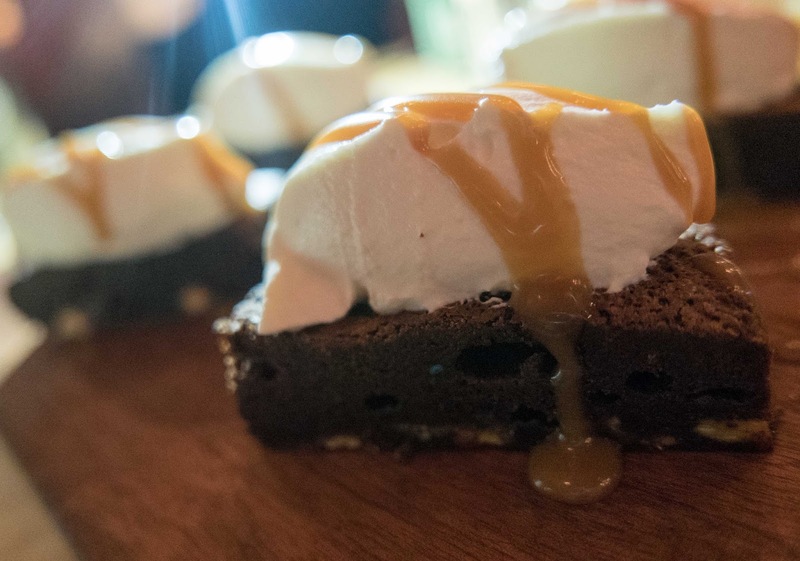 Time then for dessert: Chocolate, banana and caramel brownie, with a whiskey sauce. Obviously, if you had whiskey remaining (I didn’t), you could have tried a drop with this. Killian had ended his whiskey intro with a toast to friendship and the lovely evening finished in that kind of spirit, old friends met and new friends made. 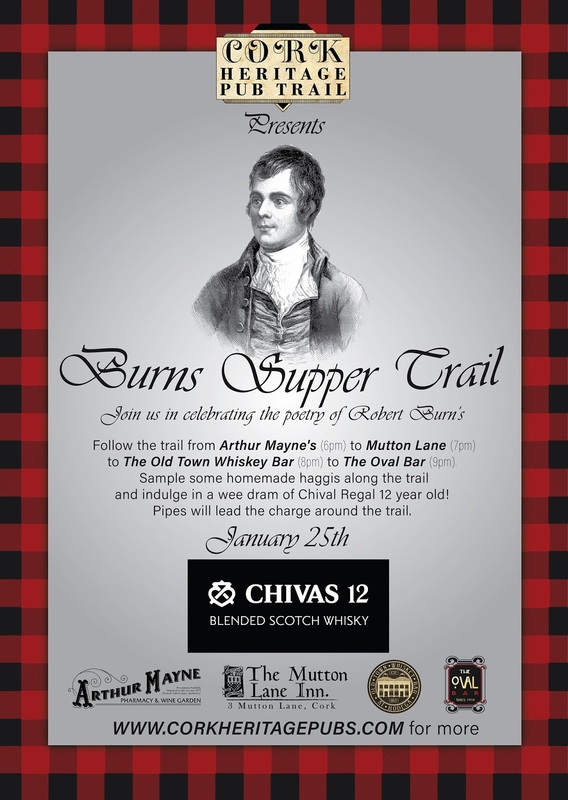 Thanks for the invite and Slainte to all at Holy Smoke.